In the 1980s The Body Shop appeared on the scene and shook up the soap market with products that sounded nice enough to eat– mango, coconut, honey, strawberry. It was timely, as the green movement was gaining traction. 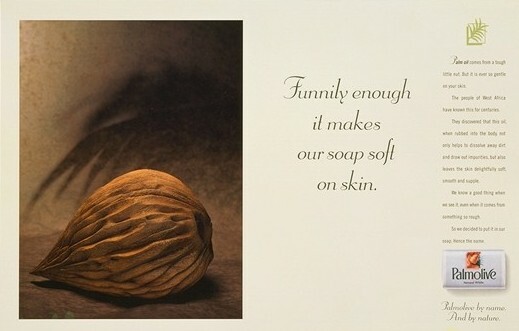 And women were quick to embrace the idea that such soaps were kinder to their skin. Colgate Palmolive, by comparison, looked dull and dated. Worse still, it was easy to imagine it coming off an industrial production line in Indiana, whereas you could picture Body Shop soap being made by hand in the third world using fruit grown by local farmers. 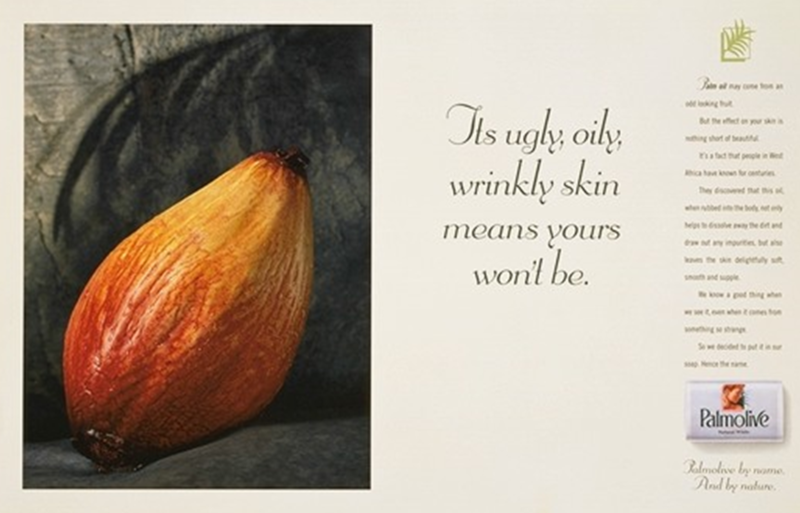 Our brief was to create double page spreads in quality women’s magazines that would “establish Colgate Palmolive’s green credentials” and suggest “a skincare benefit”. We were given surprisingly little information on how the product was made, but we figured there was a clue in the name. This was before the days of the internet so we couldn’t just rely on Google and Wikipedia. I took the tube to Charing Cross Road (where the biggest bookshops were) and bought everything I could find on soap, from chemistry to skincare. 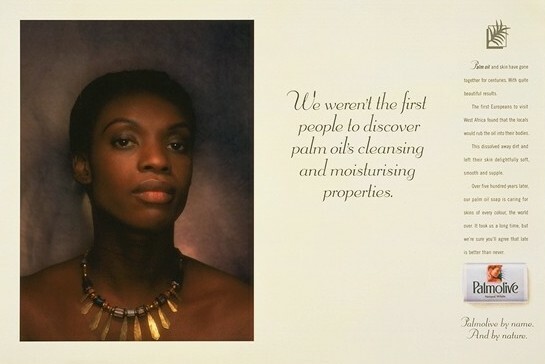 We discovered that one of the main ingredients in Palmolive was Palm Oil (hence the name, duh!). This was an extract from the Palm Nut. A fruit a bit like an avocado or a mango, it has a fleshy outer layer enclosing a rough kernel, both of which can be crushed to extract two different oils. Although these can be grown in the UK (Kew Gardens) it’s pretty hard to ripen them – so we tried to swing a trip to West Africa for research purposes. We nearly pulled it off, but not quite. We then looked at the ads being run by the main competitors (not Body Shop – what little advertising they did tended to be for the whole range of products and their shops). Rival brands liked to feature a woman in a bath covered in bubbles, with precious little reference to what went into the product. So we decided to differentiate Colgate Palmolive by taking the opposite approach – no bathing beauties and ads that, although attractive, told stories about the soap. We did one about the fruit, one about the nut and a third featuring a native woman from West Africa. Back in the 1980s you didn’t see many black models in ads, especially those run by big US multinationals, so this was quite radical at the time, and definitely different. I remember client meeting where they the people from Palmolive were very uncomfortable. They managed to avoid using the word “black” or “coloured”, preferring to suggest we picked a model who was more “aspirational”. Happily we won them over. Hopefully these three ads speak for themselves. They were very different at the time. There was a clear skincare benefit, so they were motivational. And they were executed in a very impactful and intriguing way. A classic example of a story that sells. They helped ward off any challenge from the Body Shop and established a firm foundation of green credential that the company then used to launch a huge range of new products (shower gel and liquid soaps were just entering the market). NB, the fruit and the nut are not real – they were made in a model studio. Looking at Wikipedia, years later, I think the nut model is wildly inaccurate – they should have flown us to Africa! Also, the strapline “Palmolive by name. And by nature” is ours. 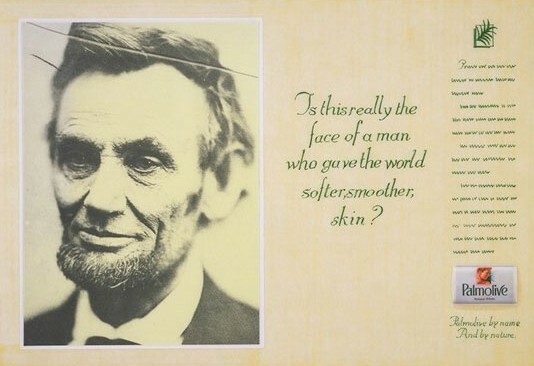 Finally, we tried to push the campaign even further with ads featuring Queen Victoria and Abraham Lincoln. They were extremely different from any soap ads we’d ever seen – but too eccentric for the cautious people at Colgate Palmolive. 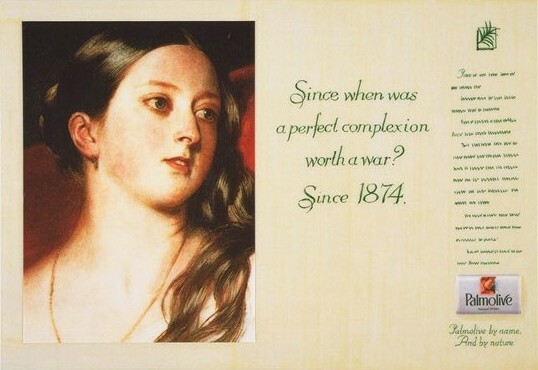 Since when was a perfect complexion worth a war? Since 1874. Palm oil soap is a very good cleanser. It’s also gentle, because the oil’s light moisturising action leaves one’s skin delightfully soft, smooth and supple. So, when cleanliness was next to godliness, and maintaining appearances was of paramount importance, our palm oil soap became extremely popular. Small wonder then that Queen Victoria sent in the army when the Ashanti tribe threatened the palm oil trade. She was merely saving face. Her own face. The face of her soft skinned subjects. And the face of future generations. Is this really the face of a man who gave the world softer, smoother skin? Funnily enough, the answer is yes. His victory in the American Civil War ended the slave trade. This then encouraged the West Africans to export palm oil instead. So it’s ironic that a man whose own complexion was so craggy indirectly gave the world a soap that leaves your skin delightfully soft, smooth and supple.